During thunderstorms electronic devices are very vulnerable to damages. Risk of over-voltage is present even in spots 1.5 km distant from the place where a lightning bolt strikes. 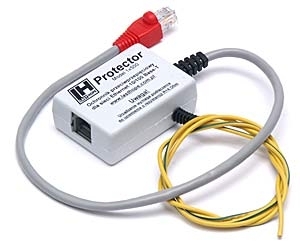 The LH Protector limits the voltage to the safe level, according to European standards set for this type of equipment. It allows to avoid structural damage. The device does not need power supplying and does not influence data transmission. NOTE: If the protected line can suffer from over-voltages higher then the values above, preliminary security measures must be used. Before beginning the installation, the electrical outlet grounding must function properly, and the protected device has to be correctly connected. If grounding fails, the protector and network will not work properly. To avoid overvoltages the protector should be connected to grounding with resistance below 4 ohm. The connection should be screwed down or soldered. It is not allowed to use lightning conductors/arresters or gas installation pipes!!! The device protects only the equipment to which is directly connected. Lack of grounding in one of the computers connected to a concentrator can result in threshold voltage without an external reason!